As Per Astrology Saturn Reaching 24 Degree mark after 14th June 2019 May bring to book the person throwing stones at others in general. Saturn Mars Rahu Ketu over natal Sun Moon and Mars after 7th May may prove bolt from the Blue as per Theory of inevitability of K N Rao . Eclipses in the 1/7 axis of the Luminaries and Anter dasha Of a planet who has the capacity to bring down fall can bring disaster in the life of a native . 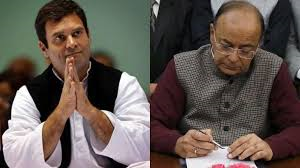 Unfortunately Rahul Gandhi Rahu anter dasha may be instrumental in this regard till 21-12 2021. since the Eclipses are taking Place in the 1/7 axis of the Sun, Moon and Mars in the month of July, Dec. 2019.